The European transfer window is well underway, with a number of big names and clubs linked to one another as always. While the summer typically brings the biggest moves involving the most high-profile names and the largest transfer fees, the winter window is no stranger to blockbuster deals. 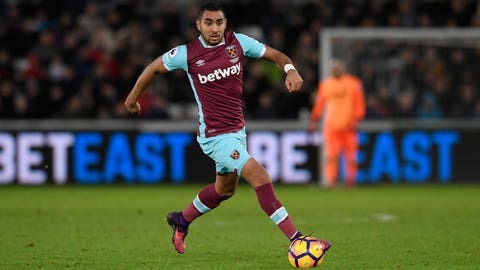 • West Ham are trying to hold on to star midfielder Dimitri Payet, with interest coming from his former club Marseille. • Real Madrid is eyeing Tottenham midfielder Dele Alli, according to reports, with a lucrative summer move potentially in the cards. Other reports indicate Spurs do not intend to sell their young star at any price. • Also linked to Madrid: Juventus rising star Paulo Dybala. The 23-year-old Argentine forward has reportedly told Madrid president Florentino Perez that he intends to sign with the club this summer. • Everton are in talks with Manchester United over midfielder Morgan Schneiderlin, with West Brom also heavily interested, according to reports. • Christian Benteke reportedly turned down a massive £40m offer from Chinese club Beijing Guoan to stay at Crystal Palace. • Middlesbrough is expected to announce the signing of Aston Villa striker Rudy Gestede on Wednesday. • Leicester City has reportedly agreed to a long-term deal with Genk midfielder Wilfred Ndidi, paying up to £15m for the 20-year-old Nigerian international. • PSG officially introduced Wolfsburg signing Julian Draxler on Tuesday. The 23-year-old’s deal runs for the next four and a half years in Paris.